If you are looking for peace and tranquillity with beautiful walks and scenery, then Yew Tree Park could be the one for you. Each home has its own private block paved drive adjacent to it with turfed lawn and decorative bradstone paths. This unique Park has all new underground services: with piped LPG gas to all homes. The Park has new automated gates to offer peace of mind and security. All our Park roads are block paved. 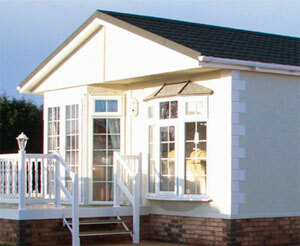 All our park homes have the 1983 written statement which gives security of tenure. Yew Tree Park also benefits from permanent planning permission. Ross-On-Wye is a very popular historic Market Town. Only a short distance from the Cotswolds and local towns such as Ledbury, Malvern, Cheltenham & Gloucester. With excellent links to the M50 and A449, you are in reach of Newport and Cardiff. Symonds Yat and Yat Rock are also local points of outstanding beauty and popular places for bird watching. Our Park offers you the opportunity to reserve a plot and design the home of your dreams. If you are interested in buying a Park Home, just contact us. We'll do the rest. Description JUST 2 plots left! 2 double bedrooms, 1 ensuite, kitchen with built in apliances, dining room, lounge, bathroom with corner bath. If you are interested in single unit availability, please contact us. Photo is for illustrative purposes only as similar model will be sited on the available empty plot. Description JUST 2 twin plots left - prices from £150,000! Photo is for illustration purposes only, same model available for siting now. 2 double bedrooms, 1 ensuite, bathroom with corner bath, study/computer room, built in appliances in kitchen. If you are interested in single units, please contact us for availability.